Patricia Johnston co-wrote the lyrics for “I’ll Remember April” with her friend, lyricist Don Raye. The song was introduced in the Abbott and Costello film Ride ‘em Cowboy. She is credited with one other work in the ASCAP ACE database, as the sole writer of “You’re My Favorite Memory.” She is not mentioned further in the dozens of reference books and websites we have checked. If you have any information on her, please contact us. 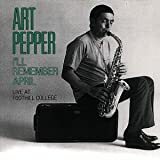 Andy Bey Includes "I'll Remember April"
June Christy Includes "I'll Remember April"
Buddy DeFranco Includes "I'll Remember April"